Video analytics have a variety of applications in CCTV systems, helping raise security to higher levels. Yet, a thick layer of information — sound — is often overlooked, or is only used passively, as an addition to the video stream. What a glaring omission! With the cutting edge technologies, audio analysis has been made a) available, b) affordable, and c) accurate. Moreover, you can keep the analytics onboard, so there is no need for extra resources on the server side. We are proud to announce that Active Shooter Detection is now available within our video surveillance ecosystem. The functionality is delivered via Gunshot Detector by Louroe Electronics, and we have integrated it with both Luxriot EVO S and Luxriot EVO Global solutions. Not only gunshots but also other wicked acoustic activity — raised voices, broken glass — can be efficiently detected, serving as a trigger point to unfold the emergency procedures. Almost any CCTV system benefits from additional modules that fit its purpose, and active audio monitoring is one of those. It can provide important supplementary evidence and verification, especially in critical locations. Be it law enforcement facilities, schools, airports, commercial spaces or office buildings, they all need enhanced security. Quite often, it is audio that can add the missing piece of the puzzle if the video stream does not provide enough information, or the camera has been tampered with. As a result, the total security level of the property, employees, and visitors is increased dramatically. One must admit, it is not the analytics alone that do the job. Depending on the use case, audio security solutions can incorporate specially designed vandal resistant microphones, intercoms, cameras with two-way audio support, and many more. On top of that, integrations with video management systems provide faster response and allow proactive measures to be taken. The technology also works in other, less obvious ways. Over time, the community obtains awareness and a better understanding of the available technologies: these are not magic anymore, and people learn how to apply them to make the environment safer and more secure. So, where exactly does EVO enter the battlefield? On one side, the integration uses Digifact A, an IP microphone by Louroe Electronics with audio analytics capabilities. It captures audio at a wide dynamic range and then streams it over different protocols, including HTTP and RTSP. The microphone's input threshold allows creating alarms based on specific dB levels. With audio analytics on top of that, Digifact can automatically detect aggression, shooting, car alarms and the sounds of glass breaking. It recognizes most firearms, including handguns, shotguns, rifles and automatic rifles. EVO, in its turn, acts as a recipient for those audio and event streams. As a smart video management system, it also provides a wide choice of security-related action scenarios. These range from instant notifications to various pop-ups and triggers for both internal and third-party modules. Digifact integration also ensures live and recording of the audio stream for later playback in the EVO Monitor application. EVO servers record incoming audio by combining it with video from other cameras. Almost every act of violence starts with verbal aggression, and recognizing it early allows for preemptive threat detection and proactive measures. Thus, the security personnel are on guard in potentially dangerous circumstances and can switch to red alert mode immediately if the situation escalates. Digifact Web interface offers a quick and easy way to set up the analysis thresholds. 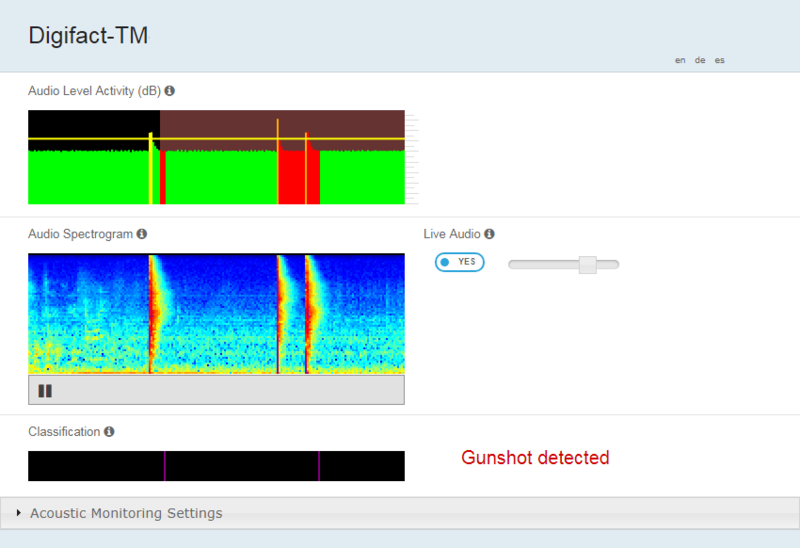 Its clear audio capture helps reduce false alarms at the input stage. As it provides several levels of alerts — from raised voice to shooting — actions on the EVO side can also include multiple stages of response. Once set up, it takes a couple of seconds for the whole system to fulfill its mission: no precious time is wasted. Thanks to the flexible Event & Action Manager, EVO can be set up to trigger long and complex reaction chains, such as evacuation procedures, audio and text alarms tied in with live video streams, extended notification series and auditing, and many more. Thus, everyone can react in real time, offering adequate activities and awareness in the unfolding situation. Traditionally, advanced analytics are widely used in CCTV. Mostly, these are applied to video, and analyzing audio is somewhat more tricky; it is therefore often used only as a complementary solution to video. If recorded at all, audio streams are merely archived, and this huge amount of information does not have a chance to be of real help. However, with the state-of-the-art AI technologies and neural networks, there is a good chance audio analysis will boost its position and become a necessary part of CCTV routines — to make this world a safer place.